Purchase a package online or call the studio. If you have a voucher, let us know the voucher number or redemption code. Our Level 1 - Foundations class series offers a week-by-week progression. Check the Class Schedule for the most up-to-date class offerings. 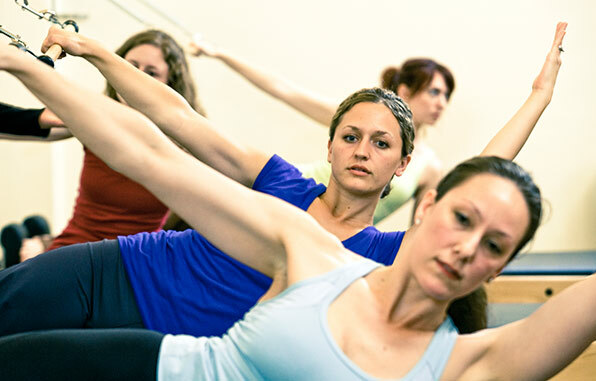 Students new to Pilates should take six to eight Level 1 Foundations classes (at least one class from each week) before advancing to Level 2 intermediate training. Please utilize all of our locations to fit our Level 1 classes into your schedule. If you take ten classes and/or private lessons within your first six weeks of training, we’ll offer you a complimentary private Pilates lesson. To receive your free lesson, please call or email us. Private Pilates lesson can become duets by adding $20 per lesson. Includes two class reservations per week, plus unlimited drop-in classes with 48-hour reservation, where space is available. Up to 4 Private Lessons per month for $59 (25% off our single session price for non-members). $8 late cancel and $15 no-show fees apply. Our no show and late cancel policies are firm. Memberships include fees when unused reservations are not cancelled 18 hrs in advance, helping maximize class use. All fees collected are loaned through Kiva, distributed as scholarships through our Instructor Certification Program, or donated.